lists - How to optimize the space used by tags in the right column of StackExchange sites? - New and Fresh Private + Public Proxies Lists Everyday! lists – How to optimize the space used by tags in the right column of StackExchange sites? In this meta-question on the site of the StackExchange UI, I work (read: jokes) to design a site for the site. I use a web tool to modify the CSS code of the page, which gives me a lot of freedom to change things while limiting myself to the available HTML rendered by the server. Each label / badge occupies a space line, even if it does not need all the horizontal width. The visual representation of the label and badge on this page seems inadequate. Although the tags and badges are designed to be displayed by themselves, for example a tag on a question or a badge on the profile of a member, they are in this case accompanied by metadata: the number of 39, applications of the tag or member. the badge is awarded to. But the visual representation always assumes a generic application. On most StackExchange sites, these elements have strong boundaries, which creates a lot of annoying negative space between each element when it rests on a line. Make them in a cloud of keywords. This would use more horizontal and less vertical space. However, tag clouds are mostly readable and unreadable. I do not know if it's a problem though. Consider a new visual representation for the tag combination with the number of applications. Maybe by including the number in the tag: <discussion]x14 would become <discussion | 14]. Or by increasing the height of the tag element and placing the "14" under the name. This would take up more space overall, but allowed multiple tags on each line. Delete the reference to a specific number of applications and instead use a visual metaphor to indicate the number of applications. Perhaps using a range of thermometers: the "hot" labels could be more red and the colder ones more blue. This would not be immediately visible to new users. Delete the reference to a specific number of applications and use the width instead to indicate the hotness. 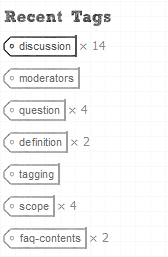 The longer a tag is (in the right column), the more popular it is. As above, however, this would be somewhat confusing at first. Time of the question: What would be an effective way to redefine how tags and badges are displayed in the right column, since I can only modify the CSS code and not modify the HTML code? Previous Previous post: turnkey on the Internet or liquidweb for the traffic with the United States, which of the better? Next Next post: [ Politics ] Open question: Are whites traitors to their race to vote?